Something dangerous is happening in Harrisburg. While lawmakers work to balance Pennsylvania’s budget, they’re also giving into special interests—and the oil & gas industry that poured nearly $1 million in campaign contributions to key lawmakers just last year. The Pennsylvania State Senate voted, with no debate and little knowledge of what was in the legislation, to approve a budget plan that could fast-track new oil & gas projects without a proper review, allow polluters to cut corners, and outsource the future of our environment to private companies. Now, that budget plan is heading to the State House. Don’t let this legislation become law: Tell your State Representative to strongly oppose any budget deal that puts the interests of industry above Pennsylvanians. I'm writing in strong opposition to the budget deal that gives far too much leeway to Pennsylvania's oil and gas industry. 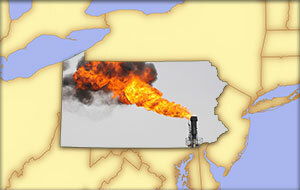 Please oppose this dangerous legislation that will increase methane and other harmful pollution. This legislation trades away vital clean air and water protections for Pennsylvanians while coming nowhere near closing the budget gap. Instead, it fast-tracks oil and gas permits, cuts corners, and outsources the future of Pennsylvania's environment to private companies. The Commonwealth does not have to choose between a strong economy and a healthy environment, but this legislation puts both in jeopardy. Please make it clear that Pennsylvania's clean air and clean water are not for sale. Oppose this bad budget deal, and any other legislation that hands industry control of the oil & gas permitting process.